Technology is going to transform not only businesses, but also the individual’s working environment, in ways that have not been envisioned before. No matter how much information we have to be able predict it, the future will have a bit of haziness to it. However, through this haziness, five features of the future office are already clearly visible. As a result of rapid technological changes, the work-desk has shrunk from 8’x8’ to an average size of 5’x2’. With this, the per-person density has now dropped to 100 sq.ft from 200 sq.ft in the 1990s. In the next few years, this density is expected to drop down further to 60 sq.ft per person, as the need to provide every employee with a dedicated desk will get replaced by activity based settings. The major enablers of this change are: reduction in the number and size of devices, millennial’s focus on open informal work settings and the need on the part of businesses to reduce their real estate spends. With telecommuting, remote working and freelancing on the rise, dedicated office resources will remain idle for a major part of their lifetime as employees get work done outside the office at convenient locations such as cafés, lobbies, airport terminals and home. Industry leaders and planners across the globe have realised that reducing travel time and ensuring work-life balance are at the centre of talent retention and increased productivity. As a result, organisations will develop workspace solutions that integrate offices with shared economy spaces including co-working spaces, hotel business centres, and work from home/near home option. The gains from such a move are two-fold: Besides reducing the real estate portfolio footprint by 50%, this will contribute to greater employee satisfaction. Transportation options will revolutionise travel. The plethora of options will include driverless cars, drones and even rockets, besides an increasing range of regular transport options, which include trains, taxis and personalised transport. All these options will coexist and allow consumers to pick the mode based on distance, thrill and cost. Vertical, horizontal and lateral means of transport will cross-connect into cities, buildings and workspaces. This revolution in the transportation sector will be built on the foundations of an extremely efficient and eco-friendly methods to get users from Point A to B. The designs will be in harmony with individual requirements and the natural environment to promote sustainable living. Buildings and Workspaces will be designed keeping the individual at the heart of all solutions. Workspaces will have multiple options that encourage individuals to sit, stand and be mobile during the work day. 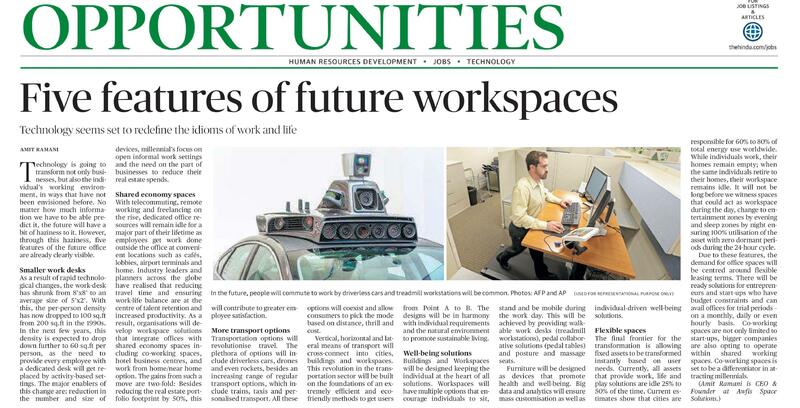 This will be achieved by providing walkable work desks (treadmill workstations), pedal collaborative solutions (pedal tables) and posture and massage seats. Furniture will be designed as devices that promote health and well-being. Big data and analytics will ensure mass customisation as well as individual-driven well-being solutions. The final frontier for the transformation is allowing fixed assets to be transformed instantly based on user needs. Currently, all assets that provide work, life and play solutions are idle 25% to 50% of the time. Current estimates show that cities are responsible for 60% to 80% of total energy use worldwide. While individuals work, their homes remain empty; when the same individuals retire to their homes, their workspace remains idle. It will not be long before we witness spaces that could act as workspace during the day, change to entertainment zones by evening and sleep zones by night ensuring 100% utilisation of the asset with zero dormant periods during the 24-hour cycle. 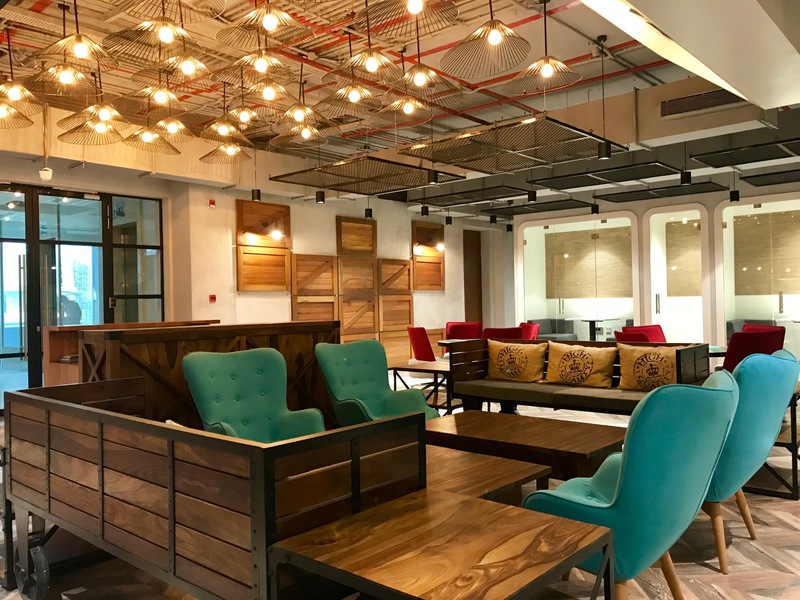 Co-working space provider Awfis Space Solutions Pvt. Ltd., which has more than 25,000 seats located in nine cities across 55 locations, has chalked out a plan to increase its seat capacity eight times to 2,00,000 in three years, a top company official said. The company’s clients include start-ups, freelancers and even small and big companies looking for convenience and affordable workplaces. “There is big demand for our spaces. There is so much latent demand and then there is so much vacancy in Indian commercial real estate. We see lot of demand from SMEs and big corporates,” said Amit Ramani, founder-CEO, Awfis Space Solutions Pvt. Ltd.
To cater to this demand, the company is planning to expand its operations and will be in 15 cities in the next 36 months. “We will add tier 2 cities. We are in nine cities now and will be in Chennai soon. Then, we will expand to Jaipur, Ahmedabad, Kochi, Indore and Bhubaneswar,” he said. “In our first year in 2016, we had less than 1,000 seats, next year we had 3,000, today we are 25,000 in the third year of our journey. We will now go to 45,000 seats and plan to scale up to 2,00,000 to 2,50,000 seats in the next 3-4 years. So that is the kind of expansion plan we have,” Mr. Ramani said. Small and Medium Enterprises (SMEs) are a big focus area of the company. “SME are getting into better office infrastructure at a comparable or better price and better value. Today, almost 50% of our business comes from SMEs and that is the largest segment,” Mr. Ramani said. The company has so far raised $51 million and is currently jointly owned by Mr. Ramani, Three Sisters Institutional Office, and Sequoia Capital. It had been tripling revenue every year. In FY17, the revenue which was ₹18 crore rose to ₹56 crore in FY18 and in FY19 it expected a revenue of ₹170 crore. “From October this year, we are profitable at the company level,” he said. “In India the adoption of co-working has been very quick as compared to global markets,” said Sumit Lakhani, CMO, Awfis Space Solutions. “Co working trend in the U.S. started in 2007-08 and it took almost seven years for enterprises to warm up to the concept. The first 6-7 years it was primarily for start-ups and freelancers. But in India, in the last two years, every large Indian corporate to MNC to SME has quickly adapted to it though it is a major culture change,” Mr. Lakhani added. In an area that you would least associate with co-working spaces and anything industrial, Awfis made its presence felt at E-floor of Taj Deccan this February. Spread over 7000 square feet, comprising 167 work stations, the unconventional hotel setting is a welcome change for a mundane office goer. With its branches spread across the country at Mumbai, Delhi and Bengaluru, an impressive colour palette featuring warm and bright hues including blue, purple, yellow, orange, red and maroon on their furniture runs across as a theme even in the other centres. What impresses the most are the one-of-a-kind chandeliers (sourced from Delhi) across most workstations and cabins. A unique aspect of this office space is its maze-like setup, with no common entrance. The workstations are divided into several blocks across the same floor and it’s easy to feel lost among the entrances. Most of the meeting rooms feature extensive graphic art and a bunch of inspirational quotes (ideal for a startup atmosphere) like ‘Innovation is the only way to win’, ‘I don’t need alarm clock, my ideas wake me’ on the doors. Members of Awfis can pre-book the meeting rooms (equipped with HDMI-enabled television sets); otherwise an average five-seater is open for use at a nominal cost of ₹ 500 per hour. The sprawling common reception area between various ends of the office instantly attracts attention. A sense of calm envelopes you at a space that leads to the terrace, offering you an unparalled view of the greenery at Taj Deccan. The absence of the conventional bustle of a busy main road is a true value addition to this space. Since seating is flexible, startups/freelancers can choose to request for a particular workstation/cabin. Based on the firm that’s willing to rent a space, the design of the spaces can be altered too. 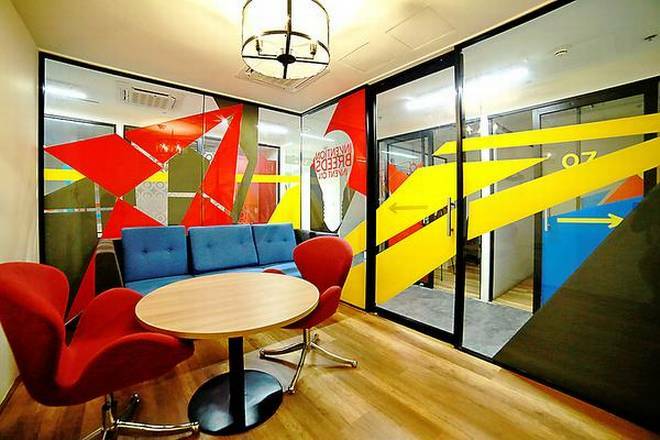 A section of the office space transforms itself into an event zone, if the need arises. A pantry will make its presence felt at Awfis soon. From firms in real estate sector to the banking sector to online portals and freelancers, many have enrolled in Awfis with much happiness. Shashikanth, a co-founder of an online portal Grabyourjob has already hired his staff from a network of clients at Awfis. “From startup, investment events to special benefits at venues like Hard Rock Café besides portals like Bookmyshow and Oyorooms, Awfis does a lot more than offering office spaces,” its community manager Chaitanya Reddy informs us. Another branch of Awfis comprising over 500 workstations will open at Gachibowli soon.